Fluctuation-induced phenomena are ubiquitous manifestations of the statistical and/or quantum nature of a system. They are present in many areas of physics ranging from quantum optics to gravity, from statistical physics to cosmology and include a multitude of interdisciplinary topics. The exact knowledge of these phenomena is rapidly becoming important for the characterization of modern experimental set-ups and has important implications in a wide range of distinct disciplines. This feature issue gives a modern inside view of this exciting multidisciplinary field of research, from the perspective of photonics systems. It collects papers that feature fluctuations in light-matter interactions as a common Leitmotiv, covering areas of quantum/atom optics with strong impact in fundamental science as well as in numerous technological applications. K. A. Milton, “Casimir-Polder forces in inhomogeneous backgrounds,” J. Opt. Soc. Am. B 36, C41–C45 (2019). V. Henning, B. Spreng, M. Hartmann, G.-L. Ingold, and P. A. M. Neto, “The role of diffraction in the Casimir effect beyond the proximity force approximation,” J. Opt. Soc. Am. B 36, C77–C87 (2019). D. Reiche, M. Oelschläger, K. Busch, and F. Intravaia, “Extended hydrodynamic description for nonequilibrium atom-surface interactions,” J. Opt. Soc. Am. B 36, C52–C61 (2019). D. Szilard, W. J. M. Kort-Kamp, F. S. S. Rosa, F. A. Pinheiro, and C. Farina, “Hysteresis in the spontaneous emission induced by VO2 phase change,” J. Opt. Soc. Am. B 36, C46–C51 (2019). C. Henkel and P. P. Schmidt, “On anomalously large nano-scale heat transfer between metals,” J. Opt. Soc. Am. B 36, C10–C14 (2019). S. Gauvin, J. Zyss, and C. Walker, “Detection of” anomalies” inside microcavities through parametric fluorescence: a formalism based on modulated commutation relations and consequences on the concept of density of states,” J. Opt. Soc. Am. B 36, C62–C76 (2019). H. Jabri and H. Eleuch, “Perfect squeezing of terahertz light by two quantum wells using a squeezed vacuum reservoir,” J. Opt. Soc. Am. B 36, C1–C9 (2019). A. 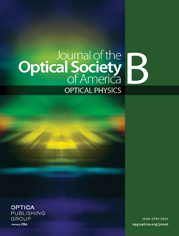 Pick, A. Cerjan, and S. G. Johnson, “Ab initio theory of quantum fluctuations and relaxation oscillations in multimode lasers,” J. Opt. Soc. Am. B 36, C22–C40 (2019). S. D. Penn, M. M. Kinley-Hanlon, I. A. O. MacMillan, P. Heu, D. Follman, C. Deutsch, G. D. Cole, and G. M. Harry, “Mechanical ringdown studies of large-area substrate-transferred GaAs/AlGaAs crystalline coatings,” J. Opt. Soc. Am. B 36, C15–C21 (2019).